I wonder if I have fallen into this category of people. I was checking my blog on the topic of heaven that I thought I might have written about, and I found two of it, one in 2008 and one in 2014. The one in 2008 was more well thought of than the one in 2014, and today, I had thought of writing about heaven in the same line of thought but looking back, my writing today wouldn't have been so thought out. I don't think reading too much is bad. It's just that I know I've grown lazy in my thinking. However, trust my CG-mates to tease me for reading so much. 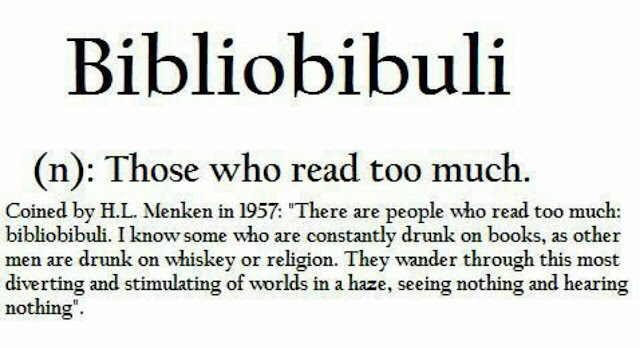 They labeled me with this word: bibliobibuli. "They wander in this most diverting and stimulating of worlds in a haze, seeing nothing and hearing nothing." Oh dear. Oh no. Really?